Gov. Bruce Rauner approaches a lectern Tuesday at the Old State Capitol Historic Site. He distributed a video message on the night before 10 days of special sessions he called to spur action on his economic and political agenda and a state budget. Brian Mackey reports on where Republicans and Democrats stand heading into 10 days of special sessions. 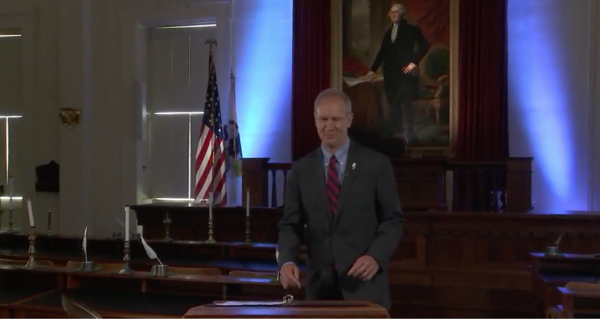 Rauner delivered a video message last night from the Old State Capitol Historic Site. It lasted three minutes, and was timed so it could be carried live on the evening news. “Right now, our state is in real crisis. And the actions we take in the days ahead will determine how history remembers us,” Rauner said. The governor outlined what he’s demanding from the special session: namely, legislators taking up his economic agenda, then sending him a budget. "We’ve asked the General Assembly to come together in a special session for the next 10 days – not as Democrats and Republicans – but as leaders who share bipartisan concern for our state’s future,” Rauner said. Democrats say the governor’s call for “unity” rings hollow, since Rauner and the Republican Party have been attacking Democrats in TV commercials and direct mail. Democrats also say they’ve tried to meet Republicans partway on Rauner's agenda, but the governor has deemed their legislation not good enough. Rauner has made his agenda a precondition for negotiating on the budget throughout his term, meaning both parties are pretty much exactly where they’ve been for two years of stalemate. Gov. Bruce Rauner has called state legislators back to Springfield this week. He says he wants a budget deal. But Rauner is also spending money attacking Democrats.